Taken with Olympus E500 digital camera February 27th 2007. Click image for larger view. Found a small place on the coast that was filled with different kinds of beautiful shells. 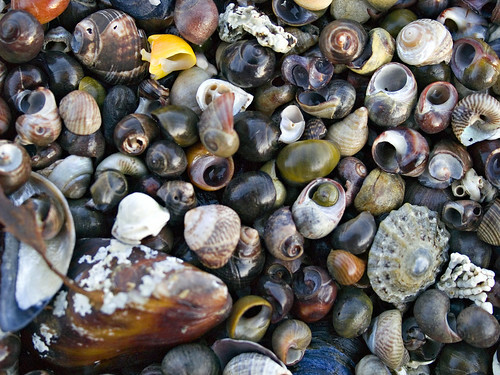 I had to take a picture of a selection of the shells. Anyone know what the shells are called? Great photo and lovely colors. Should have been there with my camera. I know some of the names in Norwegian, but not in English. I know for sure that I can see some periwinkles (two different species) and a common limpet. This picture is amazing, I love pictures like this when you can sit and look at them for ages – always finding smoething new about it. Hi! IÂ´m Mariano from Argentina…I entered your blog and I like it a lot..
iÂ´ll put you in my links now.. I don’t really know anything about shells but this picture is really neat. I would love to find a beach filled with shells like this. I found your blog on mybloglog and I love your pictures. I’m gonna link to your blog so more people can see your awesome photography. Incredible shells! I had no idea they can be so beautiful and tinted. Great photo! I love your photo. Absolutely beautiful! Could turn into another “Find the Face” illusion…. Nice and crisp with excellent focus! We have always called them snail shells, but I don’t know what the real name for them are. Great variety of colours on that shot. I love the frame to frame fill of the shells. Blue tint looks a little cold, this might look neat with a light warming filter on it too. I love this picture. So you just walked up on this natural mosaic? Fantastic! Looks great on my monitor by the way.